After three seasons starting at cornerback for the Cardinal, junior Alex Carter has announced his decision to forgo his final year of collegiate eligibility and will declare for the 2015 NFL Draft. He made the announcement in the aftermath of the Cardinal’s 45-21 romp over the Maryland Terrapins in the Foster Farms Bowl on Dec. 30. Carter received All-Pac-12 honorable mention in each of his three seasons on the team. 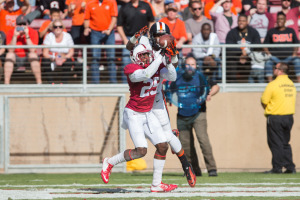 Although he started as a kick returner as a true freshman in 2012, his physical, technically sound play at cornerback was difficult to ignore and earned him a starting spot by the Cardinal’s week seven game against Cal. Once Terrence Brown ’13 left to pursue his NFL ambitions, Carter assumed the Cardinal’s leading cornerback role and started all but two games in his final two seasons, missing one due to a concussion and playing as a reserve in the other due to the nagging effects of an injury. In his three seasons, he accounted for two interceptions, 17 passes broken up and four forced fumbles while playing solid coverage against many of the talented top receivers in the Pac-12. He was one of the key cogs in a secondary whose sound play allowed for the aggressive Stanford front seven to achieve its success. 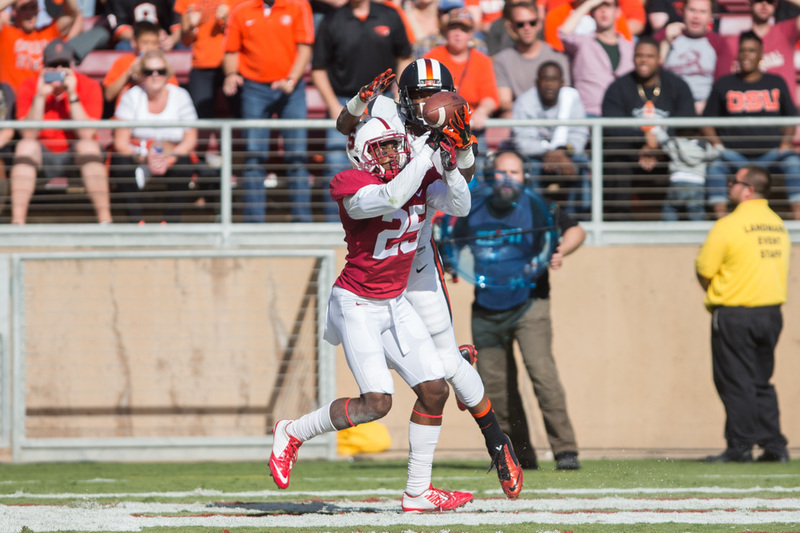 This season, the Stanford secondary finished seventh in the nation with just 175.7 passing yards allowed per game. Before he arrived at Stanford as a freshman, Carter registered a 4.4-second 40-yard dash, a vertical leap of 40 inches and less than 10 percent body fat — numbers that were already NFL-caliber but have likely improved under Shannon Turley’s strength and conditioning program. He will aim to become the third former Stanford cornerback on an active NFL roster, joining the decorated (and outspoken) Richard Sherman ’10 of the Seattle Seahawks and Johnson Bademosi ’12 of the Cleveland Browns. Carter’s declaration also comes on the heels of another, more personal announcement: Just a week ago, he became engaged to longtime girlfriend Ariana Alston. Carter will likely appear alongside other teammates looking to jump to the ranks of the NFL at the NFL Combine in Indianapolis in February and at Stanford’s pro day in the spring.